By David Berry: The light heavyweight division is on the cusp of what may be a total overhaul. Andre Ward (32-0, 16KO), the WBA, IBF and WBO champion, has now twice-vanquished former champion Sergey Kovalev (30-2-1, 26KO). Both are claiming interests in higher weight classes, and may soon leave the division. And then there's Adonis Stevenson (29-1, 24KO), the WBC champion who, in addition to being perpetually inactive, will be 40 years old in two months. Close behind them are a number of rising prospects; Oleksandr Gvozdyk (13-0, 11KO) and Artur Beterview (11-0, 11KO) are perhaps the most-known at this stage, but 18 months from now, there may be an entirely new crop of talent at the top of the division. And while the greater public may not know it yet, Ahmed Elbiali (15-0, 12KO) looks primed to be among them. Elbiali returns to the ring on Tuesday, July 18 at Rapides Coliseum in Alexandria, LA on Premier Boxing Champions' Fox Sports 1's "Toe to Toe" Tuesdays, where he'll take on the hard-punching Leo Hall (8-2, 7KO). The main event features featherweight prospect Miguel Flores (21-1, 9 KOs) taking on former title challenger Chris Avalos (26-5, 19 KOs) in a 10-round showdown. It's easy to see why Elbiali could soon be a known force in the sport. The Al Haymon-signed 175-pounder has a little bit of everything you'd want in a rising star. Still just 26 years old, he's handsome, quick with a smile, and often just as quick with closing the blinds on his opponents' nights once the bell rings. His punching prowess has become the go-to footnote among TV commentators, as he's blitzed through opponents with a string of highlight-reel knockouts, making his way to ESPN's top plays while doing so. Perhaps the only thing that can hold him back is himself. 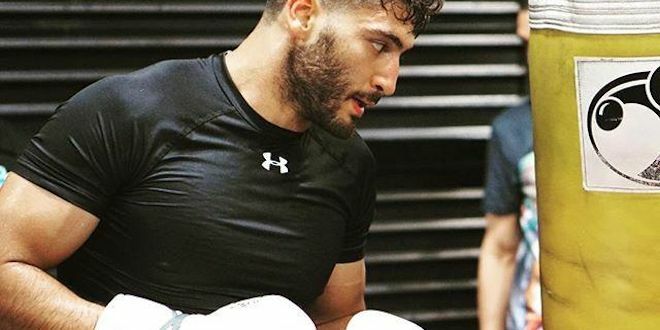 Elbiali will be fighting for just the second time in 18 months, after suffering a broken left hand in the first round of his gutsy eight round unanimous decision win over Andrew Hernandez 19-5 (9KO) in January 2015. In the midst of his recovery, the hand broke a second time, causing Elbiali to spend nearly all of 2015 on the shelf. "As a fighter, you hate being out of the ring. You hate not being able to train," said Elbiali. "I stayed as active as possible, running and biking, but it drove me nuts not being able to punch." Elbiali returned to the ring in March, making quick work of Jackson Junior (20-9, 18KO) with a KO at 1:33 of the first round. And he showed no signs of holding back with regard to using the left hand. "I don't even think about the hand; it's healed," explained Elbiali. "When I'm in the ring, all I'm thinking about is using every tool I have to get rid of the guy across from me. I'm focused. I train that way, I fight that way." Staying active - and healthy - is now the main goal for Elbiali. He'll have a televised audience to showcase his skills once more when he steps into the ring with Hall, and as a PBC fighter with a string of vicious KOs on his dossier, he knows it's just a matter of time before the world takes notice. "If I keep winning, I know everything will take care of itself," said Elbiali. "The opportunities will come. The fans will take notice. And one day soon, I will achieve my goal of becoming a world champion." Tune in Tuesday, July 18, 2017 at 9PM ET/6PM PT to see Elbiali continue his quest to the top of the 175-pound division. Great to see him back in action. Been way too long.